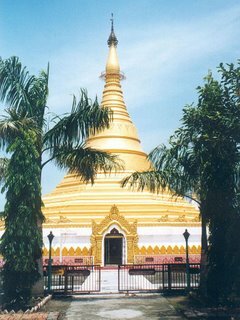 Lumbini is a Buddhist pilgrimage site located at the Nepalese town of Kapilavastu, district Rupandehi, near the Indian border. Lumbini is one of four Buddhist pilgrimage sites based on major events in the life of Gautama Buddha. It is the place where Queen Mayadevi is said to have given birth to Siddhartha Gautama, who in turn, as the Buddha Gautama, gave birth to the Buddhist tradition.According to Buddhist tradition, Maya Devi gave birth to the Buddha on her way to her parent's home . Feeling the onset of labor pains, she grabbed hold of the branches of a shade tree and gave birth to Siddharta Gautama, the future Buddha. The Buddha is said to have announced, "This is my final rebirth" as he entered the world. Buddhist tradition also has it that he walked immediately after his birth and took seven steps, under each of which a lotus flower bloomed. Lumbini is in the foothills of the Himalaya. Lumbini has a number of temples, including the Mayadevi temple. Also here is the Puskarini or Holy Pond - where the Buddha's mother took the ritual dip prior to his birth and where he, too, had his first bath - as well as the remains of Kapilvastu palace. At other sites near Lumbini, earlier Buddhas were, according to tradition, born, achieved ultimate awakening and finally relinquished earthly form. Lumbini was designated a UNESCO World Heritage Site in 1997. The Ashokan Pillar - Discovered by the now famous German archaeolgist Dr. Fuhrer, the pillar is the first epigraphic evidence relating to the life history of Lord Buddha and is also the most visible landmark of the garden. The historic importance of the pillar is evidenced by the inscription engraved in the pillar (in Brahmi script). It is said that the great Indian Emperor Ashok visited the site in the twentieth year of is ascendancy to the throne and as a homage to the birthplace,erected the pillar. Maya Devi Temple- The most important temple at Lumbini is the Maya Devi Temple, which enshrines the traditional site of the Buddha's birth.It a small pagoda-like structure, the image shows MayaDevi , mother of the Lord. Supporting herself by holding on with her right hand to a branch of Sal tree, with newly born infant Buddha standing upright on a lotus pedestal on an oval halo. Two other celestial figures are depicted in an act of pouring water and lotuses bestowed from heaven. Puskarni-The Sacred Pool: South of the Ashokan Pillar, there is the famous sacred pool- 'Puskarni' believed to be the same sacred pool in which Maya Devi took a holy dip just before giving birth to the Lord and also where infant Buddha was given his first purification bath. The Buddhist temple: The monastery-of the Buddhist temple is built inside the surrounding complex of Lumbini in the manner of modern Buddhist shrines in Nepal. The prayer hall contains a large image of Buddha. Medieval style murals decorate the walls. Thnx buddy.But every one should know that Buddha Born in Nepal.Lumbini is in Nepal. The place to visit if you have missed the greatest man ever born on this Earth. A lord who walked in flesh and Blood. Who lived a life of a mortal.Sorry, he never wished to be God. we made a God of him.He asked us to be Buddhas, we made him The Buddha. Like Jesus said "Our Father in Heaven" We heard My Father in heaven.Jesus understood Buddha, we understood none!! !